The Bulk Insert Task in SSIS is a tricky thing. It often creates a lot of confusion and frustration before it is willing to insert any rows into the database. This post will explain how it works differently in SSIS and how to solve the problems that many developers encounter. The Bulk Insert task was probably included in SSIS as a means of completing a toolset with ones that SQL devs are already familiar with. However, this is the one task in SSIS that operates in a different context. Let’s suppose that we have a dedicated SSIS server which receives files and needs to insert their data into another server which houses the SQL database. [Bulk Insert Task] Error: An error occurred with the following error message: “Cannot bulk load. The file “c:myfile.csv” does not exist.”. The package running on the SSIS Server connects to the DB server and executes a BULK INSERT T-SQL statement – no different than if you ran this as an Execute SQL task or ran it manually on the db server in SSMS. When the database looks for the file on the C drive, it is actually looking on the local DB Server. And, of course, it finds nothing because the file is on the SSIS server. [Bulk Insert Task] Error: An error occurred with the following error message: “Cannot bulk load because the file “\SSIS_ServerImportmyfile.txt” could not be opened. Operating system error code 5(Access is denied.).”. 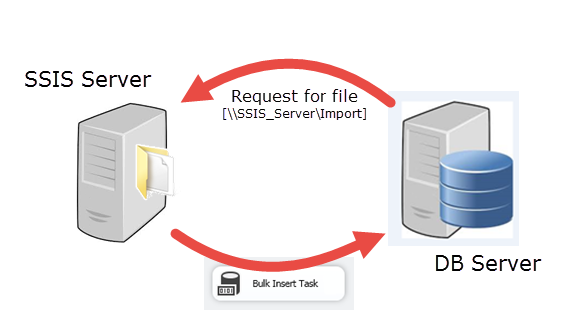 SSIS makes the Bulk Insert request in the context of the account it is running under. When the database goes to access that share, however, the server needs to delegate those permissions. If kerberos is not properly configured, then the trust relationship breaks and the server tries to access the share anonymously, and so we have an access denied error. There could be other reasons why access is denied. Suppose that you are accessing the server using a SQL login. The SQL login cannot be used to access the file system so the SQL Service account is used instead. This means that the folder needs to be granted permissions to the SQL Service account on the database server as well. In this case, it’s no kerberos issue at all, the SQL login eliminates the double hop. Let’s suppose now that we have sorted out the kerberos problems (delegated trust on the server, created the appropriate SPNs, sacrificed a goat) or we have granted permission to the SQL Service account in the case of using a SQL Login. We must also insure that we granted Administer Bulk Operations to our proxy account as well.